At least three people have died after multiple explosions targeted a political gathering attended by Afghanistan‘s chief executive and a former president in the capital Kabul, government officials said. “We have reports of explosions in the western part of Kabul. Investigations have been launched,” said Nasrat Rahimi, a spokesman at the interior ministry. Another source at the interior ministry told the local media that the source of the explosions came from someone firing mortar shells from a house in Kabul’s District 18. An official who was at the ceremony, speaking on condition of anonymity, however, told The Associated Press that seven people were killed and 10 wounded. The different accounts of casualties could not immediately be reconciled. Hundreds of people were attending the Kabul meeting to mark the 24th anniversary of the death of Abdul Ali Mazari, leader of the Hezb-e-Wahdat party. Mazari was killed by the Taliban after he was taken prisoner by them in 1995. Al Jazeera’s Charlotte Bellis said military vehicles were heading to the site. “There was intelligence last night that this [gathering] may be attacked as there are many high-value targets,” she said, reporting from Kabul. The country’s Chief Executive Abdullah Abdullah and former president were both in attendance and unharmed, AFP news agency reported. Foreign Minister Salahuddin Rabbani – who was at the scene – later tweeted “terrorists launched rocket attacks on commemoration ceremony,” and said he escaped safely. “The ministry of interior told us they have arrested one person they believe to have fired one rocket and that special forces have surrounded a house nearby to where this gathering took place where they believe the rockets were sent from,” Bellis said. Speaking to local news agency Tolo, a witness said security forces were attempting to evacuate the attendees, and that the area had already been cordoned off. “The people I saw who were evacuated were those inside their own homes, which had smoke and fire coming out of them,” the unnamed witness said. The incident came as the United States and the Taliban continue to hold peace talks in Qatar aimed at ending the nearly 18-year conflict. 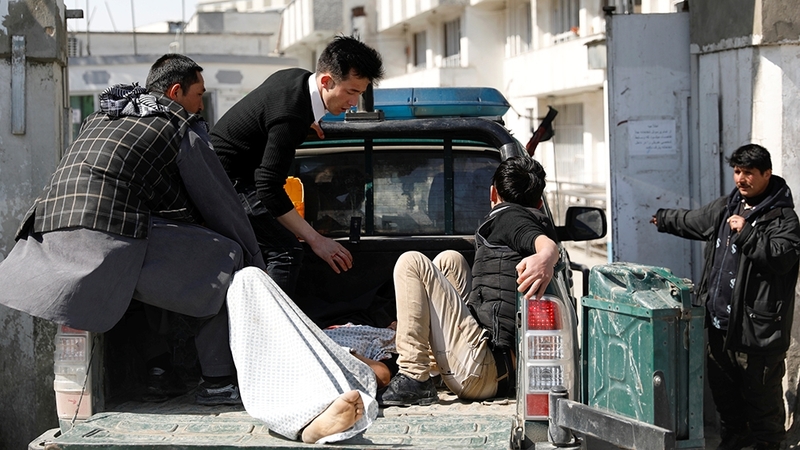 Heavy snowfall across large swaths of Afghanistan has led to a reduction in violence this winter, but warmer weather in the country’s south is likely to lead to an increase in bloodshed.